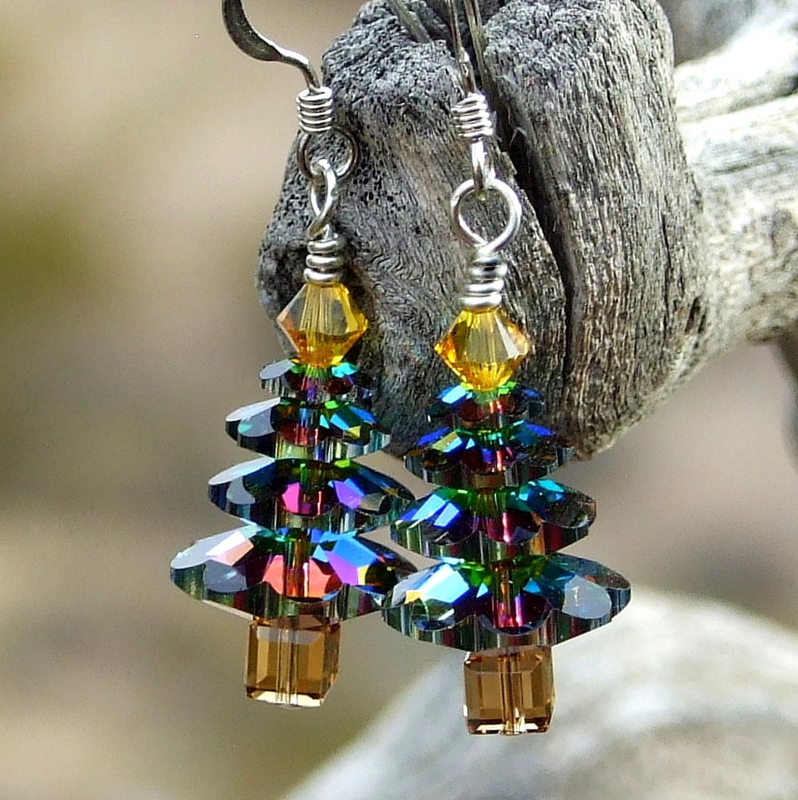 The SPARKLING CHRISTMAS TREES earrings are so well named because they deliver sparkle deluxe to your ears! 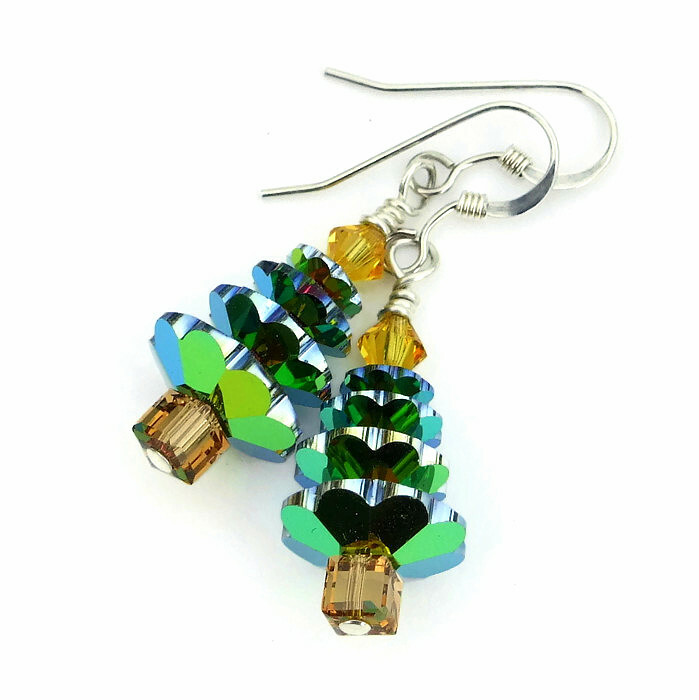 The dazzling earrings were created with four sizes of “medium vitrail” Swarovski crystal margarita discs that were stacked from bigger on the bottom to smaller on top. Medium vitrail is a special coating that was applied over half the bead. It creates a metallic play of color on the outside and amazing depth and flash inside the crystal, almost like it has its own flashing lights! 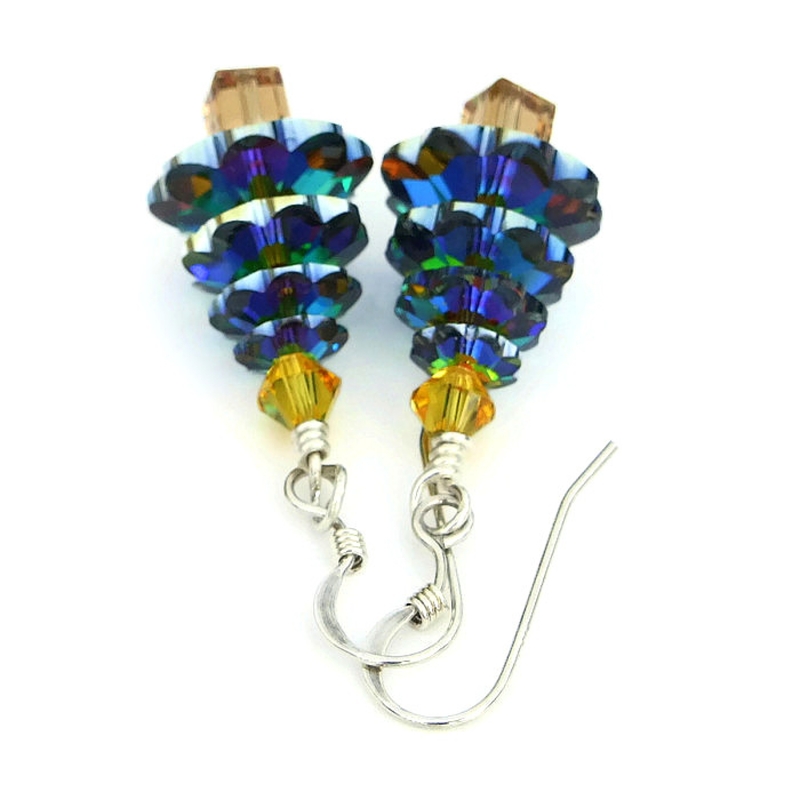 Various shades of purples, blues, pinks and green flash as the light hits the earrings. As an added bonus, the scalloped edges of the margaritas have a silvery coating that looks like frosty snow. Believe me, the photos do not do the medium vitrail crystals justice in their amazing beauty. All Christmas trees need a star so a faceted “sunflower” yellow Swarovski crystal bicones was placed on top of the stacked margaritas to represent that. At the bottom of the margarita discs are “light Colorado topaz” Swarovski crystal cubes to act as the trunk. The crystals were wire wrapped with sterling wire and connected to sterling silver French hook earwires. 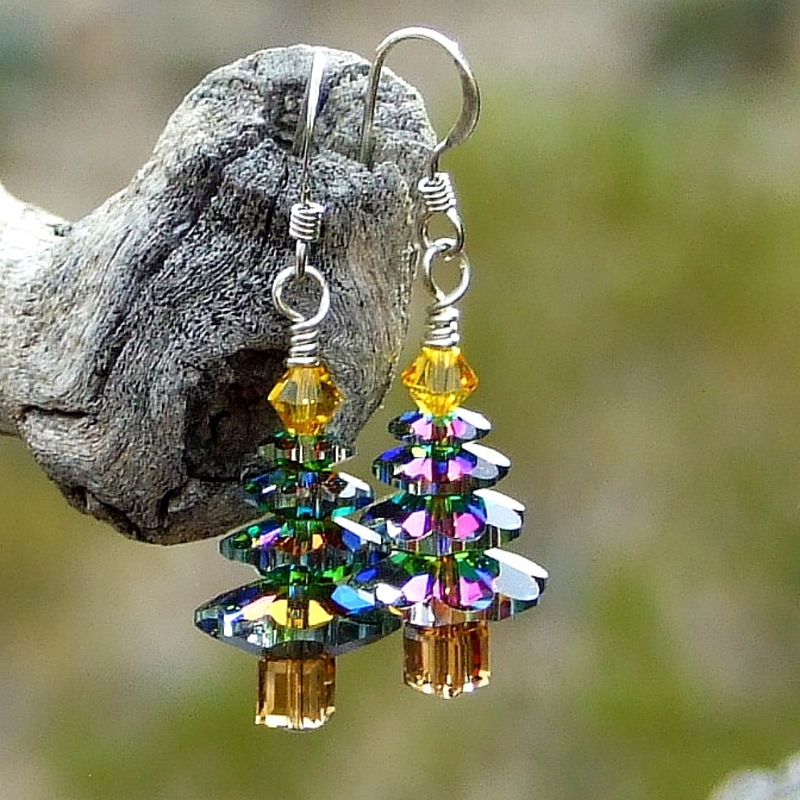 Dress the Christmas tree earrings up or dress them down, the beauties will quickly become your “go to” jewelry for the holiday season. 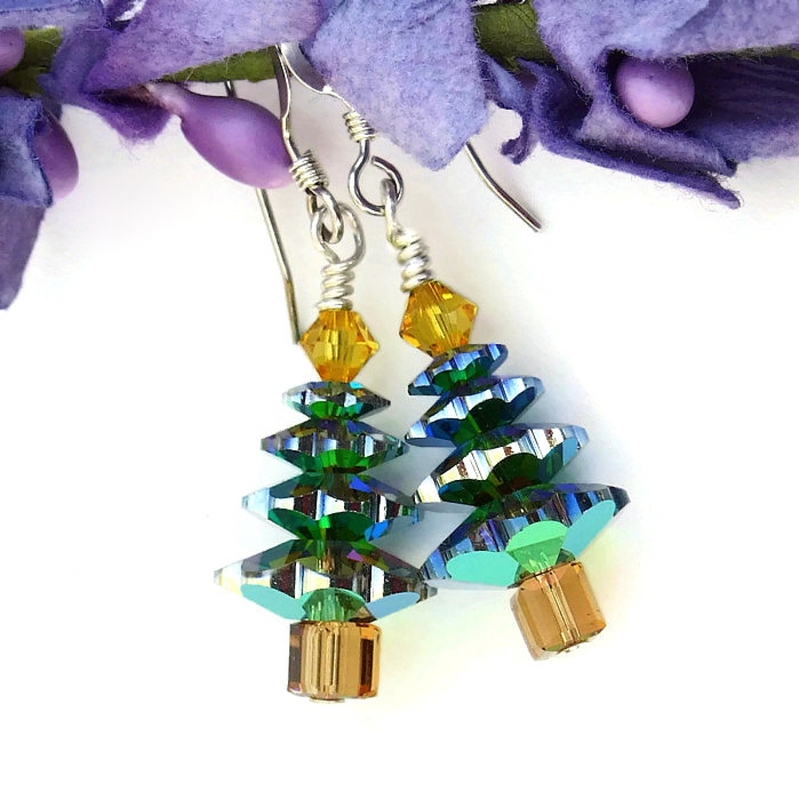 Carefully designed and handmade by Catherine of Shadow Dog Designs, the SPARKLING CHRISTMAS TREES earrings were made for the woman who loves brilliant holiday jewelry. 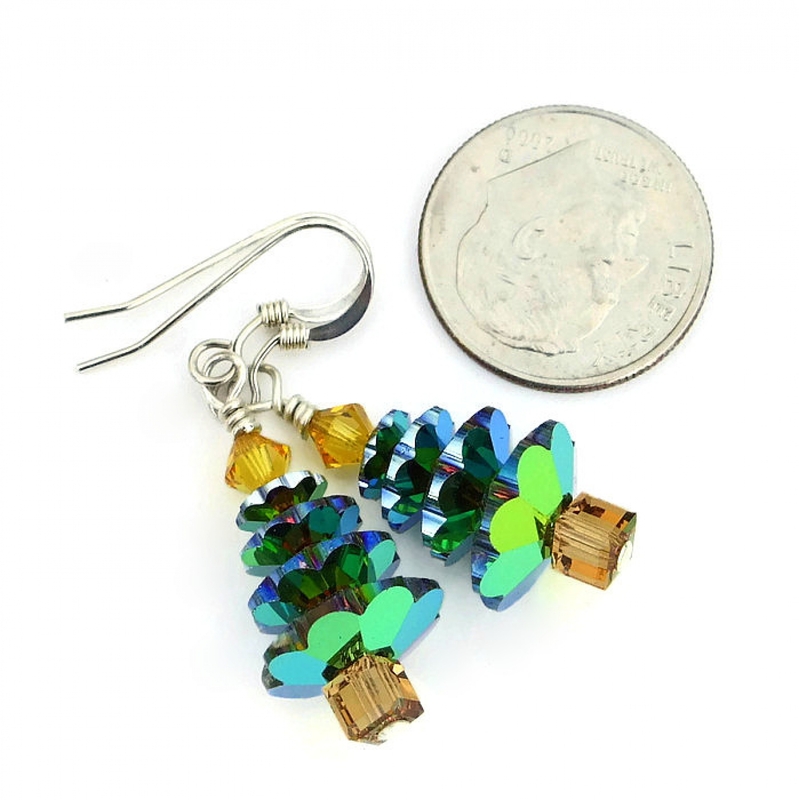 For a better understanding of the relative size of the SPARKLING CHRISTMAS TREES handmade holiday earrings, please be sure to check out photo #5 for a size comparison with a dime. Crystals (glass), although man made, carries the energies of transformation, rebirth and communication. Silver is a metal of love and healing; it is a mirror to the soul, helping us to see ourselves as others see us. 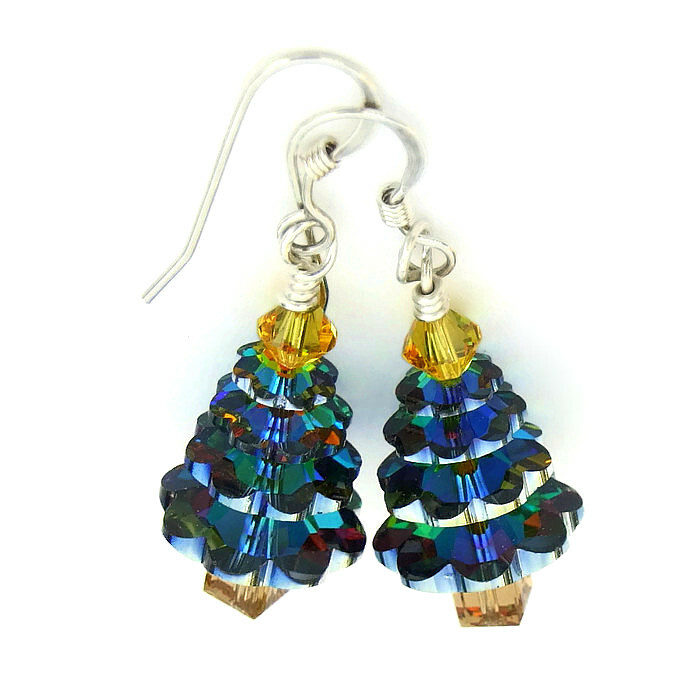 The SPARKLING CHRISTMAS TREES artisan Swarovski crystal earrings were carefully designed and handmade in a dog friendly, smoke free studio. They will be carefully packed in an organza jewelry bag with tissue, perfect for gift giving to a loved one . . . or to yourself!